As summer comes to an end, it’s the perfect time to schedule your or your child’s teeth cleaning before the school year starts. Before things get busy with homework, extra-curricular activities, and other school-related obligations, take time to ensure that your family’s teeth, gums, and smile stay healthy. In this blog, the doctors at Dental365 explain more about why it’s important and what’s involved with teeth cleaning. What are the benefits of a teeth cleaning? Preventing cavities - Plaque is a sticky film that’s filled with millions of bacteria. The bacteria use sugars in the food you eat to eat away at your tooth enamel, eventually forming cavities. Although brushing and flossing help remove plaque, regular teeth cleaning at your dental office is also an important way to keep plaque – and cavities – at bay. Improving your overall health - Taking care of your teeth doesn’t just improve your oral health – it also can have a positive impact on your overall health. An unhealthy mouth can increase your chances of having a heart attack, stroke, poorly controlled diabetes, or pre-term labor. Freshening your breath - Teeth cleaning, along with your at-home oral hygiene habits, can help freshen your breath. Saving money in the long-term - A relatively inexpensive teeth cleaning may help you avoid dental issues – and more expensive procedures – down the road. Conducting a physical exam of your mouth – Your hygienist will check for problems such as gingivitis. Removing plaque and tartar – A scaler will be used to remove plaque and tartar around the gum line and in between your teeth. Brushing – Your teeth will be cleaned with a high-powered electric toothbrush using a gritty toothpaste to gently polish your teeth. Flossing – Your hygienist will floss between your teeth. Fluoride treatment – Fluoride will be applied to your teeth to help protect them against cavities. Other steps – Depending on your needs, your hygienist may perform X-rays or recommend dental sealants for children to help protect areas that are difficult to brush well. Why get your teeth cleaned at Dental365? Dental365’s doctors were trained at the best dental schools and hospitals, and our offices are equipped with the latest technology. We place a high priority on the patient experience, offering multiple convenient locations throughout the New York metro area. Our offices take walk-ins as well as appointments, and we’re open seven days a week with extended business hours on weekdays. To help make you even more relaxed and comfortable, our exam rooms are all equipped with smart TVs with Netflix and Pandora. 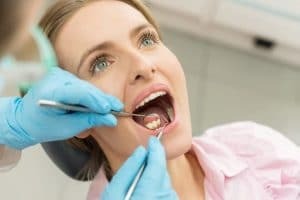 And if your teeth cleaning reveals the need for additional treatment, you’ll be able to access dental specialists under the same roof, including oral surgeons, orthodontists, and periodontists. If you’d like to get your teeth cleaned before the new school year or need another dental service, contact Dental365 today.